Two months ago, astronomers picked up and then pinpointed a location of a weird burst of radio waves from space, prompting heated debate about just what was sending them. Now, new data has finally revealed that source. “Part of the scientific process is investigating findings to see if they hold up. In this case, it looks like there’s a more mundane explanation for the original radio observations,” Harvard astronomer Peter Williams said in a statement. He is co-author (along with Harvard colleague Edo Berger) of a paper that has just been accepted by Astrophysical Journal Letters. That “mundane explanation” turns out to center around a supermassive black hole. For the last nine years, astronomers have been documenting a series of weird pulses of radio waves sent from somewhere far, far away. These aptly named Fast Radio Bursts (FRBs) last only milliseconds. They’re almost always detected after they’re over, which makes figuring out where they came from a challenge. That’s why it was so surprising when scientists were able to not only find an FRB happening in real time, but that they were also able to quickly identify its location: a galaxy 6 billion light years away. A debate quickly followed over the root source of these FRBs, and others like it. Skeptical scientists posited alternate explanations for the tracked FRB—and now, it turns out that one of the skeptics might be right. After the FRB was documented, Williams and Berger from the Harvard-Smithsonian Center for Astrophysics quickly used the Very Large Array’s group of radio telescopes to get a better look at the galaxy where the signal originated. They were surprised to find that the signal was still going strong. If it had, indeed, been a FRB, then the signal should have dwindled out rapidly after the burst. Instead, what they were seeing was cyclical, with radio emissions becoming stronger before dimming again. 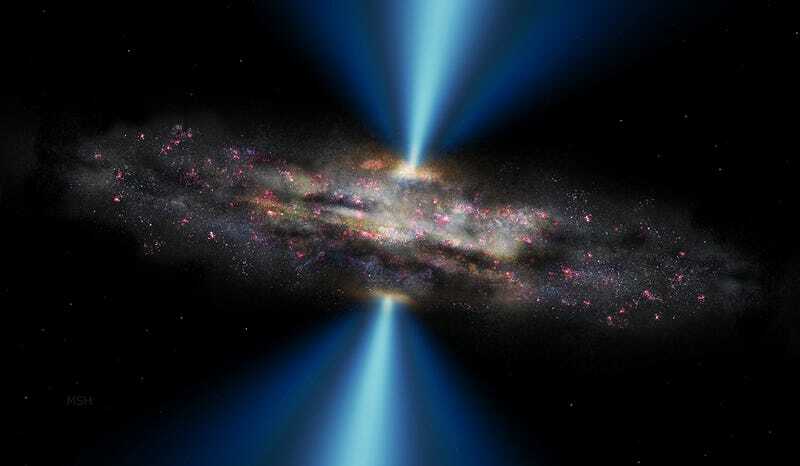 The source also soon became a clear: A massive black hole at the galaxy’s center, which was spewing out bursts of radio waves. Think of it as kind of a black hole afterglow. What it most certainly is not, is a FRB. There’s still a long record of these odd cosmic signals going back years. In those cases, the origin remains a mystery.